Combining the control of the AI Vega and unmatched power of the AI Sol, the AI Hydra brings a new level of performance. Unlike the Sol Blue & White, the Hydra uses 80 degree lenses to provide uniform light output and color blending. At a maximum of 95 watts from the wall, it follows in the family’s efficient footsteps. 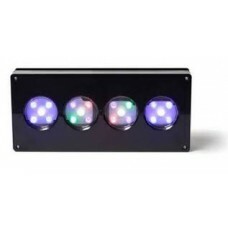 The AI Hydra utilizes the latest LED technology from leading manufacturers, arranged to provide the best performance. The Hydra fills the visible light spectrum with light to spare. 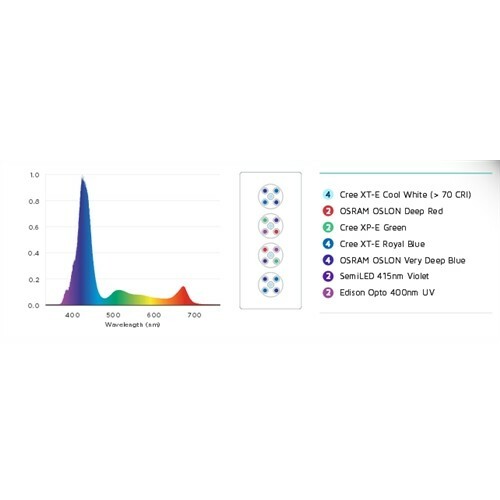 AI set the standard in LEDs, and have taken them years of experience and customer feedback to provide an even wider spectral output with the AI Hydra by adding 415nm Violet and 400nm UV LEDs to the mix. The Hydra uses proprietary 80 degree lenses to provide uniform light output and color blending. AI`s latest lens design utilizes the same TIR (Total Internal Reflection) optical design while incorporating a diffuse exit surface to optimize color blending. *Optional 50 degree lenses are available for those needing more penetration. With built-in wireless control capabilities you can connect wirelessly to any of AI`s Wireless controllers (required and sold separately) without being tethered to the light. Compatible with the AI family of wireless controllers, the New Controller (sold separately) is an easy-to-use set it and forget it solution. If you need more advanced control, our upcoming web-based Director solution can be used anywhere on the web or mobile devices. Compatible with the EXT Rail System of Rails, Tank Mounts and Hanging Kits. Learn more about the EXT Rail System. Dimensions: 11.8" x 5.3" x 2.1"